Appendix 2 - Reassembling the rotor linear bearing. These notes give a detailed step-by-step procedure for a complete disassembly and reassembly of the Facit C1-13 mechanical calculator. The description is based on the late 1960s mechanism, but is equally applicable, with minor variations, to any of the hand-cranked 13-digit models (except the CM2-13S). Significant differences are noted where applicable. The motor-driven and automatic 13-digit machines also used the same calculating mechanism, but with the addition of elaborate control mechanisms which are not described here. The notes have been prepared and refined during the rebuilding of a number of Facit 13-digit machines, and may provide a useful guide to anyone faced with a similar task. The sequence of operations described works well for me, but comes with no guarantees as to its efficiency or appropriateness. No responsibility will be taken for any consequences arising from the use of these notes by others. The notes are intended to be read in conjunction with the Technical Description on the Facit C1-13 page, and with the more general information in the Notes on overhauling a mechanical calculator. The Technical Description explains the operation of the Facit mechanism and illustrates all of the major components and assemblies, while the Notes on Overhaul describe more general techniques for disassembly, cleaning, and rebuilding. Please study this material before commencing your overhaul, and refer frequently as you proceed. A C1-13 in reasonable condition can be be completely disassembled in about 2 hours. A difficult machine might take a couple of days. Washing and initial cleaning will take about 3 hours. Detailed cleaning, checking, and minor repairs will take anywhere from 3 hours upwards, depending on the extent of the problems encountered. The actual final assembly of a set of fully-prepared parts can be completed in about 4 hours. My thanks go to Mr David Hoskins of Sydney for his many helpful comments and observations while using these notes to successfully rebuild an early C1-13. I would be happy to receive any further comments or suggestions via the enquiry form. Remove the three clearing levers. Note the small spring clips in the bottoms of the two clearing lever holes in the top cover. Press inwards on the clips with a suitable tool and lift off the cover, being careful not to slip and scratch the paint. Collect the small rubber mouldings from the four corners of the base. Remove the small right-hand cover if the winding handle will turn, otherwise leave it until later. Temporarily replace the accumulator clearing lever on the left-hand side. Invert the machine. Remove the four central screws and lift off the base, noting the arrangement of the rubber bushings. Return the machine to its normal position. Remove the slotted backing plate behind the keyboard, and the rotor and register masking plates. Observe the sliding plate above the rotor which indicates the active position on the two registers, and remove its supporting cross-bar. Some models have special shouldered screws, others have plain M3. Lift out the indicator plate if it is free, otherwise leave it until the rotor is removed. Disassemble the base and top cover and set aside for cleaning. Unhook the large rotor spring from the post at the left-hand rear corner of the base plate. Remove the screw and washer securing the rotor carriage shaft at the left-hand side. Work the shaft free and remove it to the left. Remove the two screws holding the carriage support bar across the front of the machine. Ease the bar out and down to clear the dowel pins, unhook the wire link to the division setup key, and remove the bar. Note the tall vertical arm at the front right-hand side, with a guide plate and post at the top and a small spring through the right-hand side plate. Carefully remove the short pin securing the spring on the outside of the plate. Remove the post and guide plate, then undo the shouldered pivot screw and remove the arm. Disconnect the large positioning arm from the small link at the left-hand end of the carriage. The circlip is often missing. Remove the screws in the rotor bearings at each side, and carefully ease out the bearings. Lift out the rotor and carriage together from the left-hand end and set aside. Remove the screw and spring washer securing the bell. Remove the screws and ease out the carry rotor bearings. Remove the rotor from the left-hand end. Check for shims on the ends of the shaft or stuck to the inside of the bearings, and set aside. Unhook all of the register detent springs. The spring tails are at the top of the machine, just behind the slotted bar at the back of the registers. Lift the spring tails and push them to the right to release them from the tabs on the detent levers. Check that all the register wheels can be turned by hand. Usually the numeral wheels will be stuck together side-to-side, and the star wheels below will be stuck to their shaft. Coat with metho and work loose. They don't have to be free, just movable. Free up the accumulator shaft, pinion, and clearing lever so that they are able to move. If you have the facilities, make a simple tool from 50mm of 17mm round rod with a 5mm pin in the end. Press the accumulator clearing lever down and insert the tool into the hole provided at the front of the side plate to keep it in position. Otherwise, insert a suitable rod into the hole and pack to hold the lever fully down. Remove 2 screws from the cam plate on the left-hand end of the accumulator shaft, and lift off the plate. To remove the accumulator shaft, the keyway must be aligned with the slots provided in the housing and in the numeral wheels. Neither of these slots are visible when the register is assembled. Rotate the shaft so that the keyway is horizontal and facing to the rear. Rotate the dials by hand to bring the zeros to the normal position (aligned with the hole in the central support). Gently withdraw the accumulator shaft, twisting slightly and adjusting the dial positions as necessary. Remove the dials, then remove the shaft from the housing. Carefully disassemble and record the clearing components remaining on the shaft. Leave the clearing lever held down. Free up the counter register shaft, pinion, and clearing sector so that they are able to move. Carefully remove the screw in the spring retainer plate at the right-hand side of the counter register and remove the plate. Remove the screw and rubber buffer attached to the carry lever detent bar, just behind the counter clearing sector. Most machines had a neoprene buffer, but some had polyurethane which has almost always disintegrated. Push the clearing sector into the slot and fully to the rear. Note the steel cam plate set into the sub-frame where the counter shaft passes through. The plate is retained by a large U-shaped clip on the left of the sub-frame. Grasp the clip firmly with pliers and pull it straight out. Rotate the counter shaft so that the keyway is horizontal and facing forwards. Align the dials by hand to bring 3.5 to the home position (ie, halfway between 3 and 4). Withdraw the shaft a short distance, twisting slightly as necessary. Push the cam plate to the right until it is clear of the frame, revealing an opening for the shaft. Lift the complete register assembly up and out through the cutout in the frame. Remove the dials, then carefully disassemble and record the clearing components remaining on the shaft. Free up the carry lever detent pins (in the top rear cross-bar) so that the levers will move up and down. The pins are often stuck tight in the detent bar. Note that there is no detent pin on the leftmost counter carry lever. Remove the small retainer plate on the detent cross-bar above the counter carry levers. Lift the levers and place a support under them so that their lower ends are held clear of the slots in the star wheel shaft. Remove the screw holding the star wheel shaft retainer to the lower front face of the cantilevered support, between the two registers. From the right-hand rear, push the retainer forward and out. If you have the facilities, take a moment to make a star wheel shaft extension tool by fitting a M3/0.5 screw onto the end of a 5mm rod and handle. Otherwise, borrow a long 3mm screw from the top of the cantilevered support and screw it into the LH end of the star wheel shaft. Tap the star wheel shaft to the right and work free, then pull it out to the left. Rotate the shaft if the accumulator carry levers catch in the slots. Collect the 21 star wheels (all identical). Remove the screw, flat washer retainer, and triangular plate at the left-hand end of the detent and carry lever shafts. Free up the (larger) carry lever shaft and remove it towards the left. Collect the carry levers. The counter and accumulator levers are different and easily distinguished. Place the machine on its back, remove the detent lever shaft, and collect the levers and springs. These are all identical. From the top, remove 3 screws and lift off the upper carry lever guide. From the left-hand rear, locate the light spring along the back of the quotient coupling. Note how this is attached to the lower slotted guide plate so that the spring lies flat. Remove the screw and spring washer attaching the guide plate to the cantilevered support. Remove the guide and carefully unhook the spring. Remove the two screws at each end of the carry lever detent bar. Ease the bar off its dowels and remove, then remove the centre support. Do not remove the centre support first, as downward pressure on the screws may break the unsupported die-cast cross-bar. Remove the blocking pin and the accumulator clearing lever. Free up the drive train on the right of the machine. A jammed handle is usually caused by the two small intermediate gears at the rear being stuck tight to the fixed pivot pin. Apply solvent to the gears, and work them until the handle can be turned far enough to remove the top-cover filler plate from the handle shaft. Observe the square cross-shaft above and towards the rear of the keys, and locate its screw-in pivot in the left-hand side plate. Loosen the lock nut, remove the pivot, and let the end of the shaft drop. Remove the winding handle stop. On very late models, remove the eccentric adjusting bush set into the handle stop mounting plate. Loosen the three large screws attaching the inner sub-frame to the right-hand side plate. Back off the screws about 2-3mm and push the sub-frame inwards. Locate the U-shaped spacer bracket around the three gears near the top of the sub-frame. The bracket is retained by a long screw through the right-hand side plate. Remove the screw, rotate the bracket rearwards, and pull it out towards the rear. Loosen the sub-frame screws further if more clearance is needed. Locate the pivot point of the V-shaped arm under the middle gear. On early models this arm has a fixed pivot and circlip, and is removed after the sub-frame plate. On late models, the arm has a removable pivot and is best removed before the sub-frame. Remove the screw and flat washer retainer on the right-hand side, withdraw the pivot shaft, and extract the forked arm towards the front. Remove two screws and extract the counter drive shaft bearing plate on the right-hand side. Remove the screw in the bottom of the bearing and extract the tiny coil spring and detent ball. Remove the outer gear through the bearing plate hole. Push the winding handle non-return pawl forward and out of the way if it is visible at the top left of the hole. Free up the long shaft where it passes through the quotient coupling and the counter drive pawl. Draw the shaft and centre gear to the right and out through the hole, then lift out the quotient coupling and pawl. Remove two screws under the base and ease the side plate off its dowels. Remove the guide screw, circlip, and interlock plate. Remove the accumulator clearing arm, spring, and rubber buffer. It is best not to remove the three adjustable stops. Remove two screws under the base, ease the side plate off its dowels and remove. Unhook the two springs from the post at the bottom rear and extract the counter clearing arm. Remove the 3 already-loosened screws and lift off the sub-frame plate. Remove the large gear. Remove the small detent pin, spring, and circlip from the bushing at the bottom of the plate. Note that the small indicator lever at the top is permanently staked in place, but remove the spring and wire retainer to avoid loss during cleaning. Remove the rotor clearing handle, trim sleeve, spring, and the shaft and roller assembly. Support the hub of the winding handle gear and drive out the tapered pin towards the front. Remove the gear, withdraw the handle assembly, and remove the long handle bearing from the side plate. Note the arrangement of the non-return pawl on the back of the driving gear, then extract the wire circlip and remove the pawl and spring. Carefully extract the wire clip securing the two small intermediate gears to their post. Keep a finger on the post so that the clip does not fly off when released. Remove the two gears. Remove the shouldered pivot screw and lever at the bottom front. Extract the square interlock shaft towards the right. Lift the setting arms, and rotate the shaft as it passes under. The shaft can be removed by manipulation only and does not require force. Remove the small lever and spring on the right-hand end of the detent plate. Note the arrangement of the small lever and torsion spring between the 3 and 4 keys. Unhook the spring from under the post on the lever. Remove the spring on the side of the left shift key, and on the lever assembly behind the right-shift key. Unhook the spring near the centre of the rocking escapement plate. Leave the bottom end attached to the wire retainer under the baseplate. Remove the circlip from the right-hand end of the front key shaft. Back off the locking screw for the front key shaft on the top of the left-hand pillar. Note that this is usually a plain screw, not a grub screw. The end may be deformed from contact with the shaft, and undoing it further than necessary may damage the tapped thread in the pillar. Drive the front key shaft slightly to the right to work it free, then remove it to the left. Be careful not to damage the circlip groove. Back off the locking screw in the rear shaft about 1-2mm to clear a groove in the shaft. Work the shaft free and remove it to the left. Lift off the rocking escapement plate. Note the arrangement of the pawls and spring and remove. Lift out the lever and spring between the 3 and 4 keys. Lift the keys, disengage them from the setting arms, and lift them out. Unhook the spring on the curved interlock lever from the wire retainer under the base plate, and remove the lever. The larger spring and the retainer can be left in place. Unhook the two springs from the setting arms and remove the springs and retainers through the baseplate. Back off the locking screws in the three rear pillars (no further than necessary), push out the short pivot shafts, and remove the setting arms. Remove the small spring behind the left-hand end of the front key guide plate, and another on the small lever near the right-hand end. Remove two screws securing the sliding aperture plates to the front key guide. Remove the spring plate, bushes, and sliding plates. Withdraw the pivot pin and remove the right-shift lever assembly. Remove the small circlip and roller from the post on the upper arm of the lever. Remove the front and centre key guides. From underneath, remove the circlip attaching the carriage positioning arm to the slotted connecting link. Disconnect the link from the lever arm at the other end and remove. From above, remove the large pivot screw at the left rear, then remove the carriage positioning arm and spring. Remove the circlip and roller arm assembly at the front right. Support the hub of the outer gear and drive out the rolled pin. (Reassembly will be easier if the pin does not come right out). Remove the gear and extract the counter carry drum from the shaft. Watch for shims at both ends of the drum. It is generally not necessary to disassemble the carry actuating discs unless any of the pins are sticky or damaged. If required, grip the nut gently in a vice, wrap a rag around the drum, and unscrew. Remove the discs, and watch for shims at the end. The discs are numbered, and are the same on both drums. On the die-cast versions the accumulator has discs 1 to 12, while the counter has 1 to 4 and 10 to 12. The half-round bar is pinned to disc 4 in both drums. Early versions have pressed-metal discs. Remove the return spring on the clearing wedge. Support the hub of the left-hand flange and drive out the tapered pin towards the rear. Be very careful to keep the left-hand end upright and under firm control when the pin is out, or the rotor and bearing might end up in pieces on the floor. Remove the screw and spring washer securing the cross-bar to the left-hand drive flange. Remove the flange, hold the bearing sleeve so that it stays on the shaft, and remove the rotor and cross-bar. Slide the cross-bar to the right, pull the clearing wedge out and down, and remove both parts. Decide how carefully you want to clean the bearing. Provided the tabs at the right-hand end of the bearing sleeve are not broken and the rubber buffer disc at the right-hand end is still flexible, the bearing can generally be washed out well enough in place. Put a 10mm flat washer over the shaft, tie a retainer wire through the hole at the end to keep it all together, and set aside. Otherwise, hold the bearing vertically over a dish, lift out the shaft, and collect the balls. Remove the rubber disc from against the right-hand flange. In the absence of a suitable ring spanner, place the rotor nut in a vice and tighten just enough to hold. Excessive pressure will destroy the inner sleeve. Wrap a rag around the rotor drum, grip firmly with both hands, and unscrew. The nut will usually be very tight. Lift off the end plate and remove the setting rings, pins, and pinwheel discs one at a time. The pinwheels are often stuck tight to the central core, and may jam on the key if it comes loose. Note the numbers on the discs and rings, and the order of assembly. Remove the right-hand end plate, and remove the key from the keyway if it is loose. Please review the general information about cleaning and checking in the Notes on overhauling a mechanical calculator, and proceed as described. Washing all of the disassembled parts in kerosene will take about 3 hours. 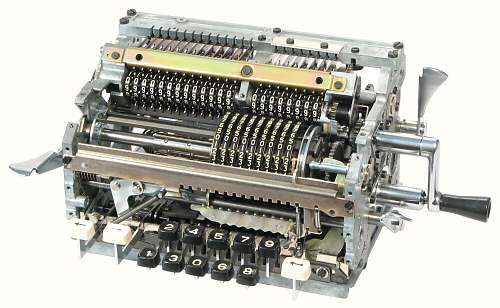 Please review the material on Reassembly in the Notes on overhauling a mechanical calculator. Moving parts should be lubricated sparingly as they are assembled. Apply a thin film of oil to steel parts with a (slightly) oily rag to prevent rust, and apply light oil or grease to gears, pivots and bearings. The pinwheels and setting rings must not be oiled. In the notes following, screws listed as (eg) M3x8 are 3mm diameter, standard pitch (0.5mm), and 8mm overall length. Tension springs listed as (eg) 3x10x0.3 are 3mm diameter, 10mm closed coil length, and 0.3mm wire diameter. Fit the centre key guide into its locating holes and fasten with 2 M3x8 screws. Check that the teeth are all in a straight line. Fit the front key guide into its locating holes and fasten with 3 M3x8 screws (2 only on early models). Check that the teeth are all in a straight line and that the swinging interlock arms all move freely. Fit the setting arms and pivot pins. The straight arm goes on the left, and above the offset arm. Fit the wire retainers to the two 4x9x0.25 springs, push them up through the baseplate, and attach them to the arms. Insert the number keys in order (1,2,3,4,0,5,6,7,8,9) and engage them with the setting arms. The small hooks on the keys go behind the central guide plate with the hooked end upwards. Place the shift keys in position. Ensure that the short lever on the division shift key is pointing upwards. Place the curved interlock lever in position between the 0 and 5 keys, with its spring into the small hole below. Check that the escapement spring in the larger hole is not caught under the keys. Place the short lever and torsion spring in position between the 3 and 4 keys. The pin on the side of the lever goes to the front and to the right. The long end of the spring goes against the side of the lever and points forwards, while the short end points straight down at the rear. Hold this lever in position by inserting a thin rod or wire from the right-hand side, through the front key shaft mountings, but only as far as the 1 key. Fit the pawls and 3x10x0.3 spring to the escapement plate and check that they move freely. The pawl with the chamfered end goes at the front. Check that the long end of the torsion spring (between 3 and 4) is still facing forwards, then set the escapement in position above the keys. The ends of the thin cross-ways lever go in front of the rear pawl and in front of the vertical arm on the division setup key. Insert the plain end of the rear key shaft from the left. Ensure that the shaft passes behind the short tail of the torsion spring and through the interlock lever, and that its right-hand end passes through the fork in the arm on the division setup key. Insert the shouldered end of the front key shaft from the left, pushing out the temporary wire. Remove the wire when the 3-4 lever is properly mounted on the shaft. Check that all the hooks on the keys are still pointing upwards, and correct as necessary. File a notch in the end of a piece of 2mm (approx) rod or wire, and use it to push down on the forward tail of the 3-4 spring. Hook the spring under the pin on the lever. Operate the lever a few times to settle it, then check that it is not causing any stiffness in the 3 or 4 keys. It may be necessary to adjust the lay of the spring if it has any tendency to spread sideways. When all seems well, check again that the key hooks are still pointing upwards, and that the cross-ways lever on the escapement is in front of the arm on the division key. Fit the circlip to the right-hand end of the front key shaft. Position the rear key shaft so that its groove is centred in the left-hand pillar, then tighten the rear set screw. Do not tighten the front screw. Attach the interlock lever spring to the wire retainer underneath, then attach the larger spring to the escapement above. If the larger spring does not sit centrally between the keys, rotate the wire retainer half a turn and try again. Place the left-shift key spring over the front key shaft, with its plain end downwards between the two shafts. Hook the front end under the key. Hold down the interlock lever (behind the 5 key) and verify that all the numeral and shift keys operate smoothly. Attach the slotted connecting link to the lower arm of the carriage positioning arm assembly and feed it in under the keys. Fit the roller arm to its post at the right-hand front, and engage it with the slot in the link. Fit the circlip and the large pivot screw. Check that the arm swings freely. Fit the small roller and circlip to the right-shift lever assembly, then install the levers and pivot pin at the left of the front key guide. Assemble the two sliding aperture plates and spacer bushes and attach to the front key guide with two M3x7 screws. The right-hand screw has a flat washer, the left has the spring plate. (Longer screws will foul on the right-shift lever). Attach the 3x4x0.25 spring to the posts behind the left-hand end of the rear aperture plate, and the 3x3.5x0.2 spring to the small latching lever near the right-hand end. Check that the rear plate slides, latches, and releases freely, and that the front plate stays where it is put. Fit the small lever, circlip, and 3x4x0.25 spring to the right-hand plate on the square interlock shaft. The long tail of the lever faces forward and down. Install the interlock shaft above the keys at the rear. Lift the right-hand setting arm and feed the shaft in from the right. Give the shaft two half-turns to pass the offset arm under the levers, then position it with the flat central plate pointing upwards between the two setting arms. Fit the narrow intermediate gear to its post, thin end down, then the wide gear. Tighten the retainer ring if necessary and install. Check that the gears turn freely. Fit the forked lever and shouldered screw at the bottom front. The plain end goes forward, with the chamfered edge down. Attach the winding handle bearing with 3 M3x8 screws. Attach the handle stop post with 3 M3x8 screws. On late models, set the eccentric adjuster near the centre of its range and leave the screws loose. Place the large end of the non-return pawl spring in the groove in the drive gear. Note that the pawl is not symmetrical. Place it over the spring with the long pointed tooth facing downwards, and the side with the more equal spacing on the left. Fit the retainer ring. Assemble the winding handle and drive gear. Ensure that the long tooth on the non-return pawl faces towards the rotor bearing and swings (approximately) equal distances to either side of the bearing housing. Align the pin holes, support the hub of the gear, and drive in the tapered pin from the front. Fit the rotor clearing lever and roller assembly, and engage the pin with the forked lever at the bottom front. Fit the trim sleeve and clearing handle on the outside. Attach the 5x47x0.5 spring from the clearing lever to the small post at the rear of the side plate. Fit the compression spring to the pointed detent pin, insert it into the bushing at the bottom of the sub-frame plate, and fit the small circlip from the other side. Fit the 3x3.5x0.2 spring and retainer to the small indicator lever at the top of the sub-frame. On early models, place the large counter drive gear in position on the sub-frame plate, then fit the forked counter reversing reset lever and circlip to the fixed pivot pin. Fit the sub-frame plate and fasten with three M4x10 screws. Firm up to hold, but do not tighten. Note that the rotor clearing lever spring will rub against the lower leg of the sub-frame plate. Fit the counter clearing arm and handle, and attach the 6x22x0.8 spring. On early models, engage the pin on the counter clearing lever with the fork at the rear of the reversing reset lever. Place the completed assembly in (approximate) position on the base. Lift the square interlock shaft, and engage the large pin at its right-hand end with the forked lever on the sub-frame. Engage the small pin into the bearing below. Engage the bottom front lever with the slot in the end of the front key guide plate. When all is in position, ease the side plate down onto the dowel pins and fasten with 2 M5x13 screws through the base. Fit the accumulator clearing arm, handle, 4.5x25x0.6 spring, and rubber buffer. If the polyurethane buffer has disintegrated, a new one can be cut from 3mm neoprene sheet. The outside diameter is 12mm, with a 5mm hole offset by 2mm to provide an eccentric adjustment. Set the narrow side against the clearing arm. Fit the interlock plate, front guide screw, and circlip. Place the completed assembly in position on the base. Engage the front of the interlock lever with the leftmost slot in the front key guide. Ease the side plate down over the dowel pins and fasten with 2 M5x13 screws. Push the front key shaft to the left until it contacts the stop pin in the left-hand side plate. This stop sets the position of the escapement, and hence controls the alignment of the rotor with the registers and the setting mechanism. Do not tighten the set screw. Insert the threaded pivot pin for the square interlock shaft. Leave about 1mm end play, and do not tighten the lock nut. Check that the square shaft moves freely between its three detent positions. Check that the detent plate is clear of the rightmost setting arm pivot pin, and reset the pin if necessary. Rotate the square shaft so that the detent plate is in its lowest position. Release the small latch at the top right of the front key guide plate, press the division shift key, and check that the detent plate rises to the centre position. Press the left shift key and check that the plate rises to the top position. Operate the rotor clearing handle and check that the plate returns to the lowest position. Back off the square-shaft pivot and the sub-frame screws about 2-3mm and push the sub-frame inwards. On late models, insert the large counter drive gear from the front, between the two right-hand plates, with its hub in the hole in the sub-frame. Back off the screws further if more clearance is needed. Observe the timing mark (dot) on the hub of the large gear. Align the timing mark on the gear with the small V cast into the front left-hand face of the sub-frame plate. Check that the flat camming surface on the hub of the gear is engaged with the end of the rivetted lever. Give the winding handle a turn clockwise to push the non-return pawl out of the way. Assemble the small buffer pin, spring, and circlip on the right-hand end of the sliding quotient coupling. Insert the long end of the counter drive shaft through the bearing hole and through the large gear. Place the quotient coupling and counter drive pawl onto the shaft, with the pawl tooth on the left. Rotate the shaft so that the tooth faces down and rearwards. Ensure that the quotient coupling spring lies behind the plate, then engage the coupling with the forked arm on the square interlock shaft. Ease the fixed gear in past the driving and intermediate gears, engage the end of the shaft into its left-hand bearing, and push the driving wedge into the slot in the large inner gear. Check that the large gear is still aligned with its timing marks, and the counter drive pawl is still facing down and rearwards. Note the inverted V cast into the inside face of the right-hand side plate, just above the counter drive shaft bearing hole. Note the corresponding timing marks on the tips of two opposing teeth on the outer gear. Set the handle in its stop. Insert the outer gear and engage it with the driving gear so that either of the marked teeth aligns with the V.
Assemble the 3/32" detent ball, spring, and M3x4 rounded-head screw in the bottom of the counter shaft bearing. Insert the bearing and fasten with 2 M3x8 screws. Insert the U-shaped spacer bracket from the rear, with the larger side against the large gear and the long arm below the shaft. Fit the turned-down M4x20 retainer screw through the right-hand side plate and through the holes in the bracket. Tighten the sub-frame screws, and tighten the square shaft pivot to leave about 0.5-1mm free play. Tighten the lock nut. Align the inner and outer gears with their timing marks. Check that the centre gear and shaft will slide easily from side to side between its three detent positions. The centre detent is a small dimple between the two grooves on the counter drive shaft. Remove and correct the gear alignment if the centre detent can not be felt clearly. On late models, feed the flat end of the counter reversing reset lever in under the centre gear. Stand the machine on its left-hand end, push the counter clearing arm forwards, and engage the forked end of the lever with the pin on the clearing arm. Align the pivot, insert the pin, and secure with the flat washer and M3x6 screw. Check that all the pins in the carry lever detent bar move freely. Note that there is no pin in the innermost slot on the counter side. Attach the cantilevered support to the carry lever detent bar with 2 M3x16 screws, then attach the bar to the sides with 4 M4x17 screws. Do not attempt this in reverse order, as downwards pressure on the screws may bend or break the unsupported die-cast bar. Feed the three long shafts (star wheels, carry and detent levers) in from the left and check that they pass reasonably freely through the three supports. The die-cast allow sometimes creeps slightly with age, and it may be necessary to ease the bearing points if the shafts are tight. Remove the shafts when satisfactory. From the rear, place the lower slotted guide plate over the quotient coupling, and insert the star wheel shaft far enough to locate the upper mountings. Fasten the guide plate to the centre support with 1 M3x8 screw and spring washer, then remove the star wheel shaft. Attach the quotient coupling spring to the small hole in the guide plate, in such a way that the spring lies neatly along the plate. It may be easier to attach the spring before fastening the guide plate. Attach the upper guide plate to the top front of the machine with 3 M3x6 screws, but do not tighten. Press the accumulator clearing lever down, insert a suitable rod or tool into the 5mm hole near the front of the side plate, and pack between to hold the lever fully down. Place the clearing gear onto long end of the accumulator shaft so that the notch engages with the broad pin near the end. Follow with the small spring and the small flanged washer, concave side first. Fit the washer over the spring, and fit the C clip into the groove. Place the plastic sleeve over the long end of the shaft, flanged end first. Follow with the large dished washer, concave side first, then the large spring. Face the keyway horizontally to the rear and insert the shaft through the housing in the left-hand side. Feed the numeral wheels onto the shaft with the zeros facing forward. Engage the end of the shaft into the centre support, press in, and turn a wheel to retain. Check that the shaft slides in and out easily against the spring, and that the notch and pin are still engaged. Fit the cam plate at the left-hand end and fasten with 2 M3x8 screws. Check that the shaft is not jammed, ie, that it still moves slightly when pressed. Turn the shaft clockwise until the keyway points to the 11 o'clock position. From the front, reach in with a small hook and pull the bottom of the clearing gear forwards to set the end of the notch against the pin. Hold the clearing lever, remove the packing, and allow the lever to rise. Help the gears into engagement if necessary. The shaft will spring out into its home position as soon as the gear turns, and the gear will spring back onto the pin near the end of the travel. Operate the clearing lever and check that the shaft makes a full turn on the forward stroke, but be careful that the gear and sector do not become disengaged at the end. Sector travel will be limited by the rotor end flange when fully assembled. Adjust the rubber buffer so that there is just a little free movement after the gear clicks back onto the pin at the end of the return stroke. Push the counter clearing sector fully rearwards, so that it enters the slot in the carry lever detent bar. Place the clearing gear onto short end of the counter shaft so that the notch engages with the broad pin. Follow with the small spring and the small flanged washer, concave side first. Fit the washer over the spring, and fit the C clip into the groove. Feed the steel cam plate onto the long end of the shaft, dished side first. Assemble the numeral wheels onto the shaft, leaving about 3mm clearance from the cam plate. Keep the keyway and the 3-4 figures to the front. Place the assembly in position, with the cam plate on the right of the sub-frame and the tab facing forward. Ease the cam plate into its housing, and engage the shaft into the centre bearing. Check that the keyway is facing forward, the shaft is fully to the left, and the notch in the gear is engaged with the pin. Place the plastic sleeve over the short end of the shaft, flanged end first. Follow with the large dished washer, concave side first, then the large spring. Fit the retainer plate at the right-hand end, press in against the spring, and start the M3x8 screw. Temporarily insert the 5.5mm carry lever shaft from the right to locate the top of the retainer, centre the lower hole over the register shaft, and tighten the screw. Remove the temporary shaft. Draw the top of the small gear forward to take up the slack in the notch. Bring the clearing sector forward and engage it with the gear. Fit the rubber buffer to the underside of the cross-bar with the narrow side forward. Operate the clearing lever and check that the shaft makes a full turn on the forward stroke. Fit the retainer clip onto the inner face of the cam plate. Carefully press the accumulator clearing handle down until the star wheel shaft can be inserted into its hole under the accumulator shaft. Insert a 5mm pin into the locking hole at the front of the side plate to hold the handle in position. (If you press the handle fully down the sector will come off the clearing pinion and the engagement will have to be repeated). Turn the machine upside down with the back towards you and support it at a suitable angle. Attach the extension tool (if available) to the end of the star wheel shaft. From the left, start the slotted end of the star wheel shaft into the hole above the register. Start the plain ends of the detent and carry lever shafts into their holes below. Leave the ends flush with the inside of the side plate. Take the carry lever with the bell hammer attached. Place the tail under the first slot in the detent cross-bar, and engage the body of the lever with the first slot in the two guide plates. Push the star wheel shaft inwards to hold the top of the lever, ease the tail up over the pin in the detent bar, and push the lower shaft through the pivot hole. Leave the shafts flush with the side of the lever. Place a detent lever into the next slot, with the teeth against the star wheel on the dial and the spring hook at the upper right. Push in the pivot shaft and leave flush. Place a star wheel onto the top shaft, with the longer hub to the right. Leave the shaft flush with the end. Fit the next carry lever in the same manner as the first. Take a detent lever spring, hold the long end upwards and the short end towards you, and place it between the first detent lever and the second carry lever. Push the detent lever shaft inwards so that it passes through the coil of the spring. The short end of the spring rests above the carry lever shaft. Proceed in similar manner to the end of the accumulator. Rotate the star wheel shaft if the carry levers catch in the slots. The process becomes more difficult as the pressure on the carry lever shaft increases. Finish with a spring and star wheel, then engage the three shafts with the centre bearing. Check that all the detent lever springs are properly located over the shaft. Feed the star wheel shaft through above the counter register. Fit the remaining star wheels onto the shaft, long hubs to the right, so that they engage with the star wheels on the dials. Push the star wheel shaft into the right-hand bearing until the slot for the retainer plate appears at the right of the centre bearing. Check that there is a slot between the last two star wheels. Rotate the shaft so that the slots face towards the carry lever shaft. From the front, insert the long end of the star wheel shaft retainer into its slot and fasten with 1 M3x6 screw. Remove the extension tool. Continue to install the carry levers, detent levers, and springs in sequence across the counter register, finishing with the last spring. Engage the shafts in the right-hand bearings, stand the machine back on its base, and remove the blocking pin from the accumulator clearing handle. From the left, push the shafts nearly home, fit the triangular plate, flat washer retainer, and M3x8 screw. Push the top front guide plate above the registers from side to side and let it find its central position. Tighten the three screws. Test all the dials by hand and verify that they turn freely. It may occasionally be necessary to ease some of the guide teeth sideways to allow the detent levers to rock freely. Fit the retainer plate above the counter register carry levers and fasten with 2 M3x6 screws. The lip faces downwards onto the levers. Press and reset all the carry levers, and verify that they click easily over their detents. Invert the machine again and attach the detent lever springs. Fashion a suitable tool by filing a V across the end of a piece of thin (1.5mm) rod. Place the V over the tail of the spring and press down. At the same time, press down on the register end of the detent lever to raise the tab, and hook the spring under. Turn all the dials by hand and verify that they click over the detents. Operate the register clearing handles and verify that the dials return to zero. Examine the setting rings and remove any burrs on the dished side caused by the action of the clearing wedge. The burrs will sometimes carve a matching groove in the underside of the next pinwheel and lead to a stiff setting action. Fit the key to the central core and ensure that it is held firmly in the flange at the end. Stand the core upright on its end. Fit the right-hand end plate, recessed side down. Place the #1 pinwheel onto the core with the pin slots upwards. Place four pins into the slots, leaving the ends slightly outside the edge of the pinwheel. Place the #1 setting ring over the pins and hub, flat side down, and engage the zero latch. Repeat for pinwheels 2,3,4,5,5,4,3,2. Note that the first #5 has two guide pins in the cut-out for the clearing wedge. Fit the end plate with the cut-away section facing towards the setting arms. Fit the nut with the hexagon side down. Tap the assembly on the bench to settle the discs, and tighten with fingers only. Verify that all the pinwheels operate freely. Take a suitable piece of bent wire and simulate the operation of the setting arms. Press inwards to release the latch lever, and turn the setting ring fully in each direction. There are no detents, so the rings should move perfectly freely. Correct any stiffness or stickyness, then tighten fully and check again. When all is working smoothly, place the rotor cross-bar in position from the left and insert the clearing wedge from the opposite side. If the rotor bearing has been disassembled, refer to Appendix 2 for instructions on reassembling the balls, sleeve, and shaft. Return here and continue. Place the rotor onto the bearing and fit the left-hand flange into position. Engage the cross-bar with the slot in the right-hand flange, and attach it to the left with 1 M3x7 screw and spring washer. Align the pin holes, support the hub of the flange, and drive in the tapered pin from the rear. Attach the return spring to the clearing wedge and check that it moves freely. Check the fit of the two rotor bearings into their mountings. Ease any scrapes or nicks around the bearing or the housings in the side plates. The thinner (6mm) bearing goes on the left-hand side, the 7mm on the right. Remove the bearings. Temporarily remove the right-shift lever arm and spring at the left of the keyboard. Set the winding handle in its stop. If the stop is fitted with the eccentric adjusting cam (late models only), set it near the centre of its fore-and-aft travel. Align the dot on the large counter drive gear with the V on the sub-frame. Check that the counter drive shaft can be pushed side-to-side through its detents, so as to engage the centre gear with either the large or small driving gears. Turn the large gear slightly if necessary. Leave the shaft engaged with the outer gear. Hold the rotor with the cross-bar just forward of top. Insert the right-hand end of the shaft into the bearing housing, and lower the left-hand end into position. Engage the gears, insert the two bearings, but do not insert the screws. Check the rotor home position by lifting the interlock plate on the inside of the left-hand side plate. The plate should engage with the notch in the rotor end flange. If not, withdraw the right-hand bearing, disengage the gears, and turn the rotor to correct. Check that the counter drive shaft can still be pushed back to engage with the larger gear. If not, look down between the gears and note the extent of the misalignment between the rectangular driving wedges and their engagement slots. Remove the right-hand rotor bearing, disengage the gears, and turn the large gear to correct. Replace the bearing, re-check the home position, and re-check the counter drive shaft. When all looks OK, set the shaft to the centre position. Hold the rotor fully to the right to avoid fouling on the registers, and give the winding handle one turn clockwise. Note that the centre gear moves outwards. Carefully operate the counter clearing lever and check that the gear returns to the centre. If there is any resistance, stop immediately and repeat the alignment procedure. Repeat the test for anti-clockwise turns. The machine must be able to turn clockwise, clear, anti-clockwise, clear, then clockwise again without any trace of stickyness or jamming. Do not proceed until this operation is correct. (On late-model machines, fine adjustments can be made by moving the winding handle stop). Note that the rotor bearing mounting holes are not symmetrical. Align the right-hand bearing and fasten with 3 M3x8 screws. Align the left-hand bearing, fit the cover plate and end stop, and fasten with 3 M3x9 screws. Check that the rotor shaft has a small amount of end play, and adjust if necessary. Place the vertical arm which operates clearing wedge into position at the front right-hand corner of the base plate, and fasten with the shouldered screw. Draw the 3.5x4x0.4 spring through the adjacent hole in the side plate and insert the small wire retainer into the recess. Fit the vertical arm support bracket to the frame with the slotted end down. Fasten with 1 M3x9 screw next to the rotor bearing, and 1 M3x16 screw through the upper hole and into the round post. Check that the arm moves and returns freely. Operate the rotor clearing lever to reset the interlock shaft to its first position (or push the quotient coupling rearwards). Attach the 3x10x0.3 spring to the locking pawl on the vertical arm of the rotor carriage. Place the rotor near the centre of its travel, and offer up the carriage with the vertical arm aligned with the groove in the rotor end plate. Lift the front of the locking pawl, then swing the carriage down and back into position. Jiggle to engage with the keyboard escapement. The front of the carriage should sit evenly about 5mm behind the front key guide. Insert the plain end of the carriage support shaft from the left-hand side to check the alignment. The shaft should slide freely through the carriage bearings and into the right-hand side. Remove and refit the carriage if there is any misalignment. Remove the shaft, attach the positioning arm to the link at the left of the carriage, and fit the circlip (if present). Replace the shaft and secure with the flat washer and M3x6 screw at the left-hand side. Refit the right-shift lever, pivot, and spring at the front left-hand side. Knock back the dowel pins at each end of the front carriage support cross-bar. Pass one end of the double-ended wire hook through the hole in the division setup key, and the other end through the bottom of the vertical arm on the cross-bar (or around the pin on some versions). Lift the bar up to engage with the arm on the carriage, check that it is clear of the spring buffer at the left, re-seat the dowels and fasten with 2 M3x8 screws. Hold the division setup key down and push the rotor fully to the left. Attach the large carriage spring to the post at the left rear corner of the baseplate. Operate the rotor clearing lever and check that the rotor returns and clears correctly. Operate the left and right shift keys and check that the rotor steps correctly. Press and hold the division setup key, and check that the rotor runs fully to the left and is caught by the latch under the front cross-bar. Check that the locking lever on the carriage vertical arm aligns with the slots in the underside of the front cross-bar. If these are reasonably well aligned, step the rotor a few places to the left and turn the handle slowly to check the alignment of the pinwheel pins and the register star wheels. The rotor position can be adjusted if necessary with the threaded stop at the left-hand end of the front key shaft. Note that the adjuster will only push the shaft to the right - if the screw is loosened, the shaft must be pushed to the left by hand from the right-hand end. Clear the rotor and check the setting mechanism. Set a full row of each digit in turn to verify all positions. The mechanism should operate quickly and easily. It may be necessary to make further fine adjustments to the escapement position to provide clearance for the setting arms. When all is working correctly, tighten the lock nut on the escapement adjuster and the set screw on the front key shaft. Start with the counter section. Place the shims onto the hollow shaft, then fit the end plate with recessed side towards the drive gear. Place discs 1 to 4 onto the shaft with the flat sides towards the gear. Place the half-round shaft edgewise into the cut-outs, twist it into position, and press it towards the gear end to engage the pin with the slot in disc 4. Fit discs 10 to 12. Check that all the discs are facing in the right direction, then fit the washer and nut and tighten. Assemble the accumulator section in the same manner on the large shaft. Fit the smaller shim(s) onto the thin end of the shaft, then place the counter drum and drive gear into position. Observe that one tooth on each gear has a small dot on its outer edge. Align the half-round bars on each drum (or the first discs on the pressed-metal models), then rotate the outer gear to align the two marked teeth. Check that the pin holes are aligned, then support the hub of the gear and drive in the rolled pin. Check that the counter drum turns freely. Check the fit of the two rotor bearings into their mountings. (The bearings are both 7mm wide). Ease any scrapes or nicks around the ouside of the bearings or in the housings in the side plates. Remove the bearings. Reset all the carry levers by pressing them down at the rear detent bar. Fit the shim(s) to the right-hand end of the carry rotor shaft. Check that the winding handle is in its home position. Locate the inverted V cast into the inside of the right-hand side plate, just above the housing for the carry rotor bearing. Face the half-round bars on the carry rotor towards the front, which will place the marked teeth upwards. Insert the carry rotor at the right-hand end first, align both marked teeth with the inverted V, and fit the bearings. Note that the bearing mounting holes are not symmetrical. Align the right-hand bearing and fasten with 3 M3x8 screws. Align the left-hand bearing, fit the cover plate and end stop, and fasten with 3 M3x9 screws. Adjust the stop for minimum end play and tighten the lock nut. Clear the rotor and counter and turn the handle forward (CW). Note that the two carry drums rotate in the same direction and the counter counts forward. Clear the counter, turn CCW, and note that the drums turn in opposite directions but the counter again counts forward. Clear the rotor and registers. Set a 1 into the rotor and carefully give the handle one negative (CCW) turn. Check that the accumulator ripple carry proceeds smoothly to the end. Turn clockwise and check that the accumulator resets and the counter carries to all 9s. Attach the bell to the rear of the left-hand side with 1 M3x8 screw and spring washer. Rotate the bell to provide a satisfactory tone on overflow. Assemble the bottom cover. Fit four supporting bushes and spacers into their holes from underneath, then fit the remaining four from the top, flat side down. Attach the feet, glue the corner mouldings in place, and attach the spring clips. Turn the machine upside down and attach the base with 4 M4x22 screws and dished washers. The screw heads go in the dished side of the washers, and the name plate goes at the front. Lay the machine on its back and attach the keyboard backing plate with 4 M3x6 screws. Put the machine back on its feet. Fit the register mask and engage the red indicator flag with its operating lever. Check that the flag operates freely. It should be hidden hidden when the counter is cleared, and should fill the window after an initial negative turn. Bend the lever slightly if adjustment is needed. Fasten with 1 M3x6 screw. Set a row of 9s in the rotor and press the division setup key. Examine the operating arm on the sliding indicator plate. Note the forked end and the offset vertical tab below. Insert the arm at the right of the rotor, so that the fork sits around the counter drive shaft and against the right-hand side of the quotient coupling. The offset tab passes through the cut-out in the quotient coupling end plate and sits against the left-hand side. Engage the supporting cross-bar with the tabs on the top front of the indicator plate and fasten with 2 M3x8 screws (or special shouldered screws if fitted). Slide the rotor mask up under the indicator plate. Align the cut-out with the numerals and fasten with 2 M3x6 screws. Remove the clearing levers, fit the right-hand cover over the winding handle, and fit the top cover. Ensure that the three tabs on the small right-hand cover are properly engaged around the cut-out. Press down to engage the clips, and replace the clearing levers. Appendix 1 - NTK variations. The earlier TK and NTK machines are identical in principle to the C1-13, but differ slightly in some of the details and methods of assembly. This section summarises the main variations. Rotor bearings. There are no adjusting plates on the rotor bearings. End play is set by fitting shims at the left-hand side. The right-hand carry rotor bearing is marked with a dot. Registers. The register clearing mechanism uses a "mutilated gear" which remains stationary on the return stroke. There is an additional spring-loaded starting pawl on the clearing sectors. The counter register is assembled in place, in the same manner as the accumulator. The star wheels, detents, and carry levers must be removed before the counter register can be disassembled. The carry lever shaft is retained by a set screw through the top of the left-hand side plate. The small triangular locating plate is on the inside of the left-hand side plate rather than on the outside. Counter register drive. The lever which moves the square interlock shaft and the quotient coupling is operated by a camming surface on the small outer gear, rather than the large inner gear. The lever is mounted on a screwed pivot which is easily accessible from the right-hand side. The resetting arm is mounted on the same pivot. Left-hand side.When removing the side plate, be careful to recover the thick spacer washer at the left-hand end of the front key shaft. Right-hand side. There is a different arrangement of levers to prevent the rotor turning while it is being cleared, and a pin to release the lock when the rotor is fully home. Keyboard. There is only one sliding aperture plate under the keys. Instead of the outer plate, there is an additional bracket at the left of the front key shaft to lock the keyboard while the rotor is turning. (On the later model, the keyboard stays locked until the rotor is cleared). The front key shaft has three small serrated pins to hold the components in position and transfer the reaction from the escapement. The pins can generally be pressed out with a pair of long-nose pliers. The division setup key operates the square shaft through a lever at the top of the detent plate rather than at the bottom. Drill a 9mm hole in a block of wood so that the rotor shaft can be stood upright. Place the block and shaft in a dish or tray so that dropped balls can not escape. Cut a chip of wood to plug the hole for the tapered pin, so that balls can not become stuck in the hole. The plug must be level with both sides of the shaft. Place the rubber buffer disc against the end flange. Cut a new disc if necessary from 1.5mm neoprene sheet. Grease the first 6-10 holes in the flanged end of the sleeve. Hold the sleeve vertically and place the first balls into position from below with tweezers or the end of a lightly magnetised rod or screwdriver. Repeat for as many balls as will stick (at least the first 3 or 4). Carefully lower the sleeve onto the shaft until the top of the shaft is level with the bottom of the next hole. Drop in the next ball, lower the sleeve, and continue to the end. It is necessary to keep the sleeve centred on the shaft and to avoid tilting. It gets easier after the first six balls are in place. To assist in holding the ball sleeve centred on the shaft, a simple split sleeve can be turned from wood or hard plastic. The example shown is 9mm inside diameter and 13mm outside, to fit between the shaft and the ball sleeve. A small notch at the top allows the tool to be inserted around the first ball to provide deeper engagement. Place the split sleeve around the shaft and tape the two halves together. The sleeve should slide smoothly without binding. Place the ball sleeve over the split sleeve so that the first hole aligns with the small notch. Tape the two sleeves together, without covering any of the ball holes. Hold the assembly over a dish or tray so that dropped balls can not escape. Slide the sleeves up until the top of the shaft is level with the bottom of the first hole (look from the side). Hold the shaft on a 45° angle with the first hole at the bottom, then roll the first ball in from the top. Lower the sleeve to the next hole, rotate 60° to bring the second hole to the bottom, and drop in the next ball. Continue to the end. Remove the tape, split sleeve, and end plug. The easiest way to assemble the bearing is to make a replica of the factory service tool. Turn a length of rod (metal, wood, or plastic) to 13mm diameter and cut six grooves lengthwise over a distance of about 150mm. The grooves are about 4mm wide and 2mm deep, so that the diameter across the bottom of the grooves is the same or just slightly larger than the rotor shaft (about 9.2mm is a good fit). The flutes between the grooves are sharpened at the front end to produce the 6-pointed star. The far end is drilled 9mm diameter, and just deep enough to cover the tapered pin hole when placed over the shaft. The tool does not need to be very precise - the wooden example illustrated was cut with a Dremel tool mounted on the toolpost of the lathe, and indexed by guesstimation from the chuck jaws. (Some years after inventing this tool, after many tedious overhauls, I was surprised to find it illustrated in a Facit service manual). The tool is held vertically over a tray with the pointed end up. The flanged end of the ball sleeve is started onto the tool so that the first hole aligns with the top of one of the grooves. A handful of balls is dropped into the sleeve and the tool pushed upwards. With a little bit of jiggling, the balls will magically appear in the correct holes. When all the balls are in place, fit the rubber buffer disc over the shaft. Place the hollow end of the tool over the shaft so that it covers the tapered pin hole, then slide the ball sleeve off the tool and onto the shaft. Original text and images Copyright © John Wolff 2008-15.